Visiting Quiet Technologies’ web store is pretty hit-or-miss for finding headsets in stock — they’re struggling to keep up with demand. That’s another pretty good sign that the headset is a good choice. But they do keep the web store updated, and with a little regular checking every few days, it’s not hard to squeeze in an order when headsets become available. For starters, the Halos come in a nice package. 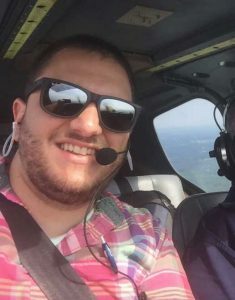 Wearing my QT Halos on a recent instructional flight. First, let’s talk comfort. Before I ordered the Halos, I’d heard from a few people that they were comfortable — and they weren’t wrong. While my Lightspeed Zulu.2s sit firmly on your head like a couple of luxurious cushions, the benefit of the Halos is that they’re so light and unobtrusive that you can forget you’re even wearing them. While some people might object to the in-ear aspect of the headset, I’d suggest trying it first. The earpieces are actually very comfortable (and if you don’t like them, it comes with a variety of other types). If you’re still not convinced and you want to test that for yourself, I’d suggest spending a couple dollars to order some ear tips directly from QT to try them before investing in the headset. The band can be worn a few different ways, but I prefer the more conventional behind the back of the head arrangement. As far as sound quality goes, the QT Halos are quiet, but honestly they’re not quite as quiet as the Zulu.2s. That said, speaker and mic quality are both top-notch. Radio calls come in clearly, and I’ve had zero issues with people trying to hear me. It’s important to note that there’s a bit of a technique to proper ear tip insertion, so getting good performance requires actually putting them in correctly. While the Halo’s ear pieces are a little more involved to put on than the conventional Lightspeed, it’s really just a momentary delay. With a little practice, I think it’s a negligible difference. With a couple dozen hours on the Halos at this point, I like the fact that the headset is super lightweight, and you can actually leave them on from the time you first climb into the airplane until after shutdown — just hold off on the ear pieces until the avionics master is on, and you can communicate easily with the radios off. The QT Halo headset can lay totally flat in a low-profile flight bag, like this Brightline B2. Portability was one of the primary reasons why I bought my QT Halos — and it’s fantastic. The Halos can basically lie totally flat in a bag, effectively taking up zero space. Besides trimming down the heft of a full flight bag, the portability of the Halos makes it practical to bring them along on trips where I’ll be flying commercial and doing some GA flying once I get to my destination. In the past, I’ve used some really unpleasant head-clamp loaner headsets, so having my personal set with me is a big perk. It’s really not practical to bring a full-sized headset like the Lightspeed Zulu.2s along for the ride when luggage space is at a premium, but it’s a piece of cake with the QT Halos. 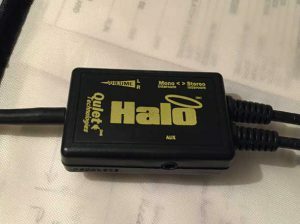 The volume controls on the QT Halo — now with aux in! The Halos have a small controller with dials for left and right ear volume, a mono/stereo switch, and an aux input. One sidetone: when switching to a different plane for the first time, I found that I only had one ear working — it took me a while to realize that I just needed to flip that little stereo switch to fix things. I wasn’t a huge fan of how long the acoustic tubes are that connect the speakers on the back of the headset to your earpieces. At full length, they kind of look like droopy earrings. No thanks. Luckily, you can trim the tubes if you want to (the owner’s manual includes instructions on which side to trim) — and one of the first things I did was cut them down to a less excessive size. Apparently, because the tubes are tuned, you can lose a bit of quality when you shorten them, but I haven’t noticed that in my case. Because the sound tubes are a replaceable $10 part from QT, I didn’t sweat cutting them, and I’m much happier with how they look and how compact and snag-free they are without the extra length. If you’re looking purely for comfort and sound quality, I don’t think that the QT Halos have a huge advantage over one of the flagship ANR headsets, like the Lightspeed Zulu.2 or the Bose A20. But where the Halo really shines is in the big picture: if you’re looking for a quality headset that’s just about as quiet as the ANR, but takes up zero room in your flight bag and costs a third as much? The QT Halo becomes really impossible to beat. For my money, it’s really the perfect headset for instructing. 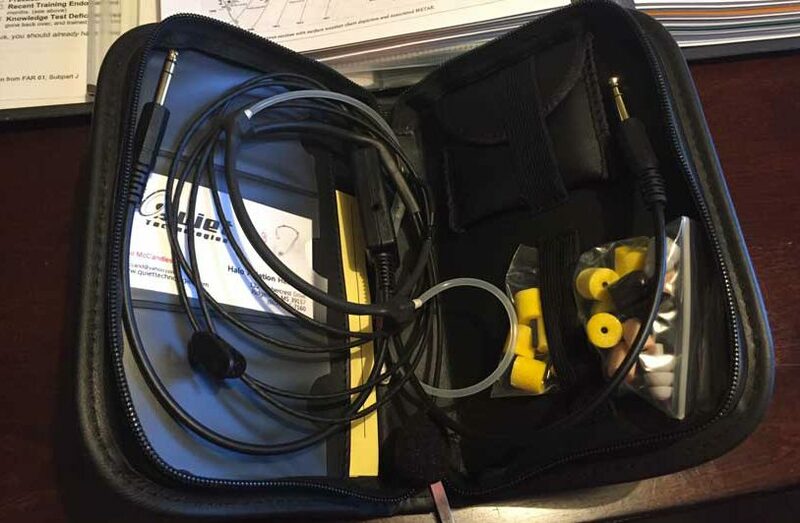 And it’s also a perfect headset for just about any other GA applications too. As much as I love my Lightspeed (and I do love it), I haven’t flown with it since my QT Halos came in — I think that says a lot. Thanks for the review, I’ll have to look into them.